Sometimes there’s just nothing better than a piping-hot bowl of soup. I think I have a little alarm bell in my stomach that starts ringing for soup any time the weather dips below 85 degrees or there are clouds in the sky–and if it rains, forget it! You can be sure I’ll be having soup for dinner. That being said, I made soup last night when it was well above 85 degrees and sunny, but it so happened that I had an exciting event to attend yesterday evening and I needed to make a really quick dinner before heading out. 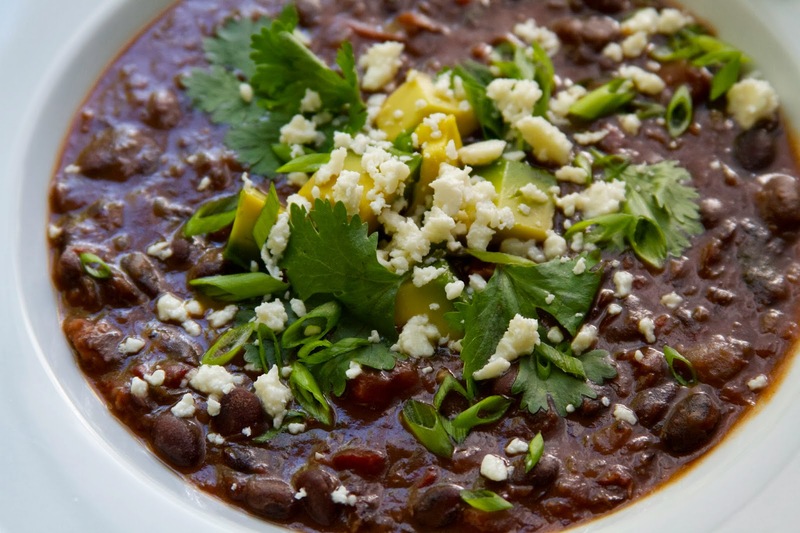 This chipotle black bean soup comes together very quickly, thanks to the use of a few convenience foods, such as canned black beans and tomatoes. If you have a food processor, then you can really save some time chopping the onions, garlic and chipotle peppers. Like any soup, the flavor is even better the following day, so if you have the time to make it ahead, definitely do so. The inspiration for this soup came from this Dave Lieberman recipe. I’ve been making this soup for a few years and I’ve made a few alterations to make it a little spicier and a little smokier. During the holidays, I make it with leftover Christmas ham and it is amazing! 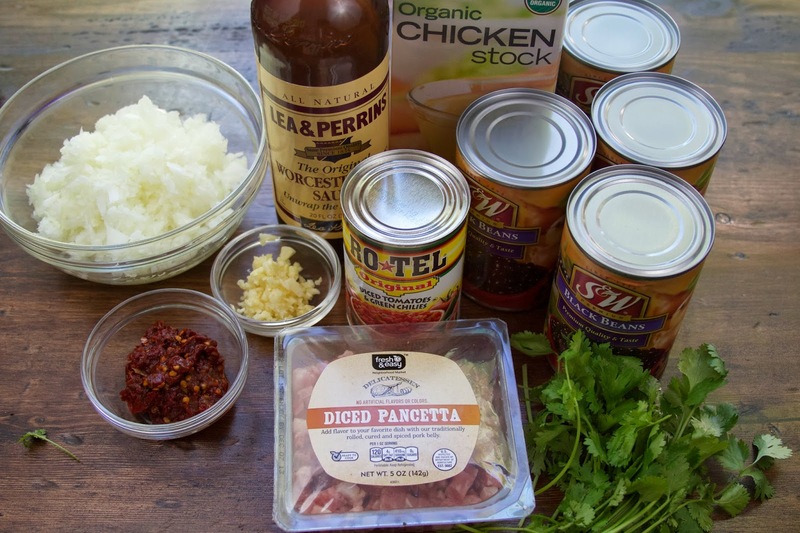 The original recipe calls for lots and lots of bacon, and while I love bacon, I like to use diced pancetta because it’s convenient and a little less fat than ten slices of bacon! The soup has a spicy, smoky chipotle flavor due to the addition of canned chipotle peppers in adobo sauce. This can be found in the grocery store in the ethnic or Mexican food aisle. Chipotle peppers are smoked jalapeño peppers. They have heat, but in my opinion, they are not so fiery hot so that you need a glass of milk to go with your bowl of soup. 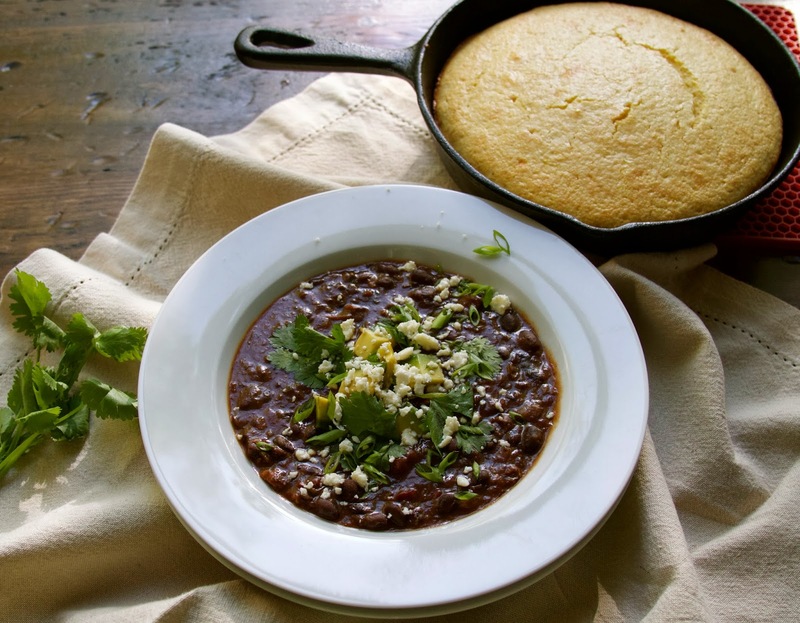 They have a smoky, earthiness that really pairs well with black beans. 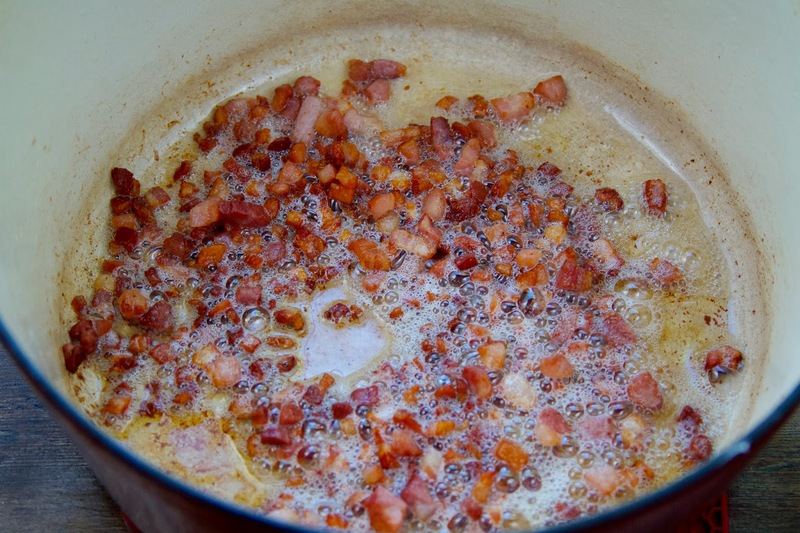 Cook the pancetta in a heavy bottomed pot on medium heat until the fat renders and the pancetta is crisp. Add the onions and garlic and sauté until softened. Add the ancho chili powder to the onions and garlic and cook for about 2 minutes. I think this is an important step because it allows the spices to distribute evenly in the soup, plus when you cook or toast spices, it deepens the flavor. Add the rest of the ingredients and bring to a boil. Reduce the heat to low, cover and simmer for an hour. You could cook it for a shorter amount of time, but a longer, slow simmer allows the soup to develop more flavor. If you would like to use a slow cooker, you could make the recipe through the addition of the chili powder and put the mixture into the slow cooker, then add the rest of the ingredients and cook for 4 hours on low heat. To make the soup creamier, during the last ten minutes of cooking, remove two cups of the soup and puree in a blender or food processor, or use an immersion blender to puree it in the pot. After you’ve blended to your preferred consistency, add the cilantro (about 1/2 cup) and stir. Cook for ten more minutes and serve topped with cheese, cilantro, avocado and more cilantro leaves. Oh, I almost forgot to tell you about the event! I had the opportunity to emcee a cooking competition at the Le Cordon Bleu College of Culinary Arts last night! It was so exciting to watch the culinary students compete and experience the frenzy of a restaurant kitchen firsthand! As soon as the photos are available, I’ll be sure to link them so you can see! Soup! It’s what’s for dinner! Previous PostStarting Fresh in the Garden and PESTS! Next PostSay Hello to My Little Friend//This Means War!